The Tibetan manuscripts from the sealed cave in Dunhuang are still the earliest that we have (along with those from the Tibetan forts in the Taklamakan desert). So, some readers might be surprised to hear that there is absolutely no agreement about why they were put in the cave, and why it was sealed up. Our failure to answer these questions remains deeply problematic. How much can we say for sure about these sources for Tibetan culture and history if we don’t know these basic facts about the reasons they have survived to this day? Marc Aurel Stein was the first archeologist to reach the caves and gain access to the manuscripts. (He did not however, discover them; that honour goes to the Chinese monk Wang Yuanlu.) In his immense reports of his expedition, Serindia, he speculates about why the manuscripts were placed in Cave 17 (the number he gave the manuscript cave). He suggested that they were essentially discarded manuscripts, which nobody needed anymore, but could not be destroyed because of their sacred, Buddhist content. They were, in his influential phrase, “sacred waste”. This idea was widely accepted by Dunhuang scholars like Akira Fujieda, and many still argue for it. In China it has a name: feiqi shuo, the “waste theory.” I’ve always found it a bit unsatisfactory as an explanation. For one thing, it doesn’t easily explain all the non-religious manuscripts in the cave, or the many beautiful and complete manuscripts (and paintings too). It seems a bit naive about the complexities of material culture. And most of all, this apparently pragmatic explanation doesn’t really engage with Buddhist ritual practice. Actually, Stein himself had a more nuanced view (he usually did). In Serindia he mentioned that some of the bundles of manuscripts looked as if they had been picked up and deposited in the cave as a religious (or as he put it, “superstitious”) act. This touches on a truth that the phrase “sacred waste” does not — that the act of depositing manuscripts can itself be a religious act. But what kind of religious act might lie behind depositing manuscripts in a cave? In this context, the prodigious store of copies of the Diamond Sutra at Dunhuang, virtually identical in content and originally belonging to only a few monastic libraries, begins to make sense: for the most part these are “receipts” for merit-giving transactions, rather than scriptures that were read. This also explains the presence of Buddhist paintings, many of them in good condition, in the cave. The pictures of donors that are often found at the bottom of these paintings show that they too were commissioned, painted, and finally deposited, in the process of creating and dedicating merit. Now, what if all the Buddhist manuscripts deposited in the cave (not just the sutras explicitly copied to generate merit) had a ritual function? This struck me a few years ago when I read Richard Salomon’s thoughts on the oldest Buddhist manuscripts in the world: the Kharosthi scrolls. It can be safely assumed that the manuscripts in question, regardless of their specific character or condition, were understood and treated as relics. The status of their written representations of the words of the Buddha as dharma-relics, functionally equivalent to bodily relics of the Buddha or other Buddhist venerables, is widely acknowledged in the Buddhist tradition. Thus, the essential motivation for interring manuscripts is obvious; it was a form of relic dedication. 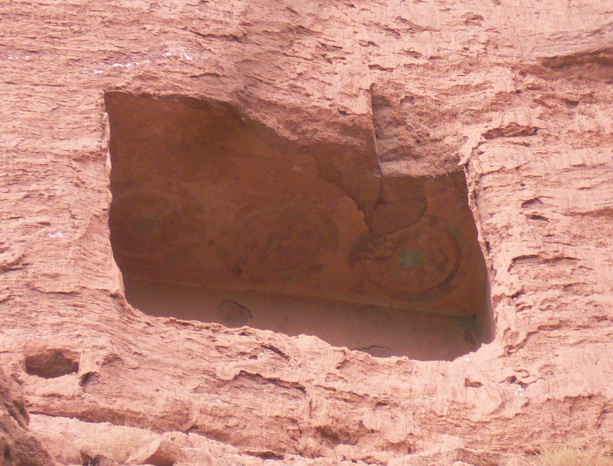 Of course, the Kharosthi manuscripts are not the Dunhuang manuscripts (as far as we can tell, the former seem to have been buried in the foundations of a monastery). Still, this way of looking at the Dunhuang manuscripts makes me doubtful of the highly pragmatic explanations of the “sacred waste” theory, like Akira Fujieda’s idea that the manuscripts were disposed of once printing was introduced to Dunhuang. Or Fang Guangchang’s theory that they were taken out of local monasteries after a large-scale inventory project. So, if the phrase “sacred waste” brings to mind some kind of fancy landfill site, understanding the manuscripts as relics might bring us closer to the world of the Buddhist monks of Dunhuang. If the manuscripts were “functionally equivalent” to the body of the Buddha, every time someone deposited a manuscript in the cave it was a ritual act, pregnant with symbolism, and operating in the system of merit creation and dedication. Even if we don’t chuck out the waste theory, this seems worth keeping in mind. Fang Guangchang. 1988. “Dunhuang yishu zhong de fojiao zhuzuo” 敦煌遺書中的佛教著作. Wenshi zhishi 1988.10: 87-90. Fujieda Akira. 1966. “The Tun-huang Manuscripts: A General Description, Part I.” In Zimbun: Memoirs of the Research Institute for Humanistic Studies, Kyoto University 9 (1966):1-32. Fujieda Akira. 1969. “The Tun-huang Manuscripts: A General Description, Part II.” In Zimbun: Memoirs of the Research Institute for Humanistic Studies, Kyoto University 10 (1969):17-39. 1. Bundles of scrolls from the cave, photographed by Stein. (c) British Library, Photo 392/27(589). 2. A painting of Avalokiteśvara, one of the high-quality and undamaged paintings put into the cave in the 10th century. (c) British Museum (Stein Collection) 1919,0101,0.2. If I seem to have missed things out in this discussion, that’s because it’s the first in a series. Next up, II: The Cave Library, and III: The Cave of Monk Wu. The Tibetan manuscripts found when the sealed cave in Dunhuang was opened in 1900 are still the oldest in the world. But many of them are not as old as we once thought. When the manuscripts were first studied it was assumed that they all dated from the time when the Tibetans ruled Dunhuang, between 786 and 848. It’s a reasonable assumption which is, unfortunately, completely wrong. Certainly some manuscripts do date from this time, but many don’t. 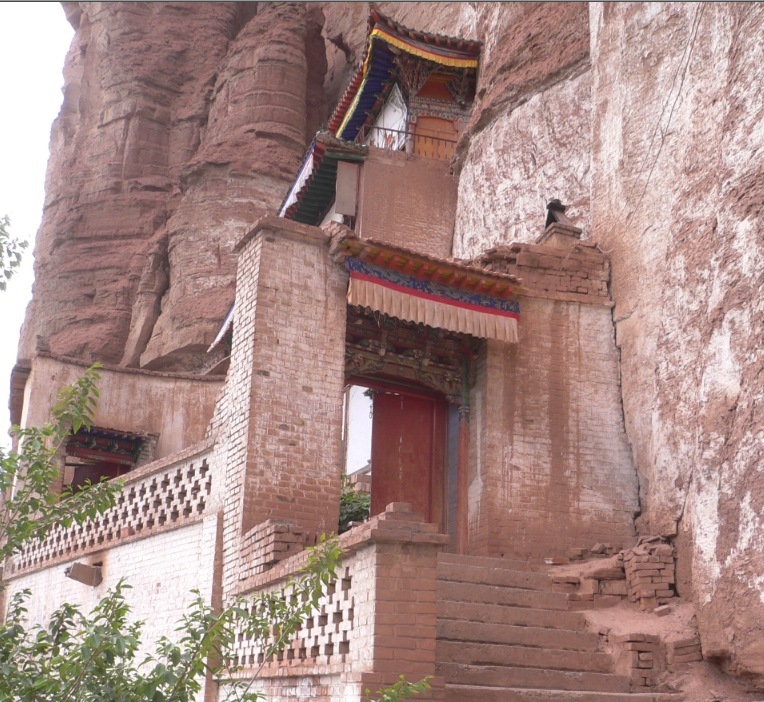 We now know that the Tibetan language continued to be used in and around Dunhuang long after the fall of the Tibetan empire, right up to the time the cave was sealed up at the beginning of the eleventh century. At first it might seem disappointing that we can’t pick up a Dunhuang manuscript and assume that it was produced during the Tibetan empire. But does dating something later necessarily make it less interesting? I don’t think so. Look at the tantric manuscripts for instance. What’s been emerging from recent studies on these is the continuity between what was practised at Dunhuang in the 10th century and the emerging Nyingma traditions of the next few centuries. 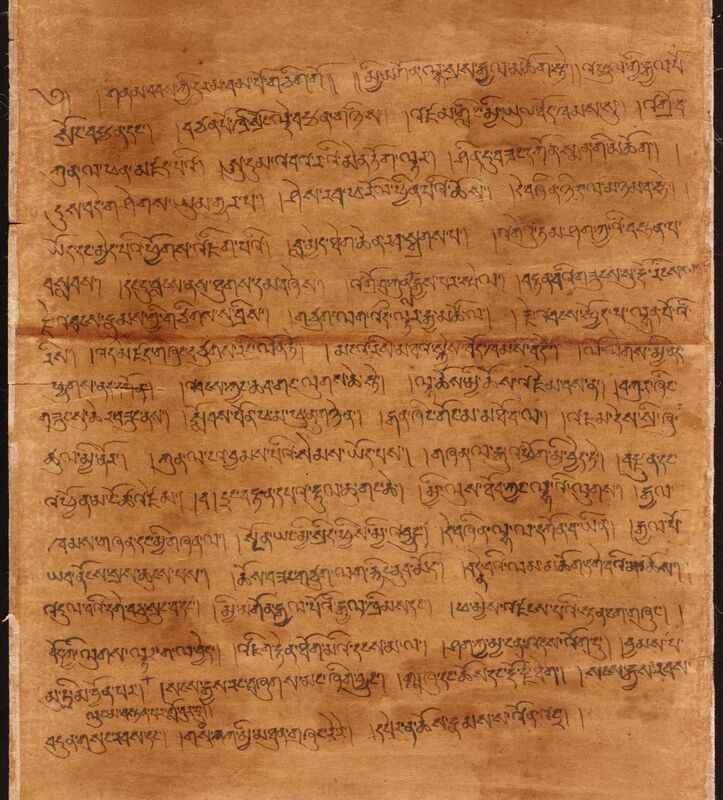 These manuscripts don’t tell us much about Buddhism in the Tibetan imperial period, but what we get instead is a glimpse into Tibet’s “dark age” when the Nyingma traditions were in their infancy. Let’s look at a manuscript that is widely assumed to have been written in the time of the Tibetan Empire. I think that it was perhaps not, and that giving it a later date might allow us to understand it better. Found on the scroll IOL Tib J 370, the text was first studied by Hugh Richardson, who translated its title as “The Dharma that Came Down from Heaven.” It tells of the activities of the great emperors Songtsen Gampo and Tri Song Detsen in bringing Buddhism to Tibet, and then goes on to lament a decline in Buddhism values in Tibet. It’s a fairly short poem, and apparently not complete, breaking off before the end. Quite why it’s called “The Dharma that Came Down from Heaven” is not clear. Though as Rolf Stein, another great Tibetologist who studied this text, pointed out, the Tibetan word dar ma didn’t mean the teachings of the Buddha in general, but more specifically, a book of Buddhist teaching. So the reference is to a book that fell from heaven — a familiar theme in the later Tibetan tradition that tells of the first appearance of Buddhism in Tibet when books fell on the roof of an ancient emperor (something I wrote about here a while ago). A better translation of the title would be “The Scripture that Fell from the Sky”. Both of these scholars assumed that the poem dated to the imperial period. In some ways, I can see why. The language is archaic. Yet looking at the scroll itself, I think it was certainly written in the tenth century. For one thing, the handwriting style does not match anything produced in the imperial period. For another, the way the text is written on the back of a Chinese scroll at the end of a series of scriptures and prayers, and in a different handwriting from the texts that precede it, is similar to other scrolls produced in the late 10th century. If we date this poem to the post-imperial period, something that puzzled both Richardson and Stein suddenly becomes much easier to understand. As I mentioned, at the end of the poem the author laments the decline of Buddhism. Both Richardson and Stein thought that this was a reference to a ban on Buddhism in the mid-eighth century, which was overturned by Tri Song Detsen when he declared that Buddhism was to be Tibet’s state religion. But this assumption didn’t help either scholar to interpret the end of the poem, which they struggled with unsuccessfully. Because the king died and his son was young, the good religion and the old learning declined. How can we practice in the Tibetan way the supreme path of truth, the religion of virtue? Or the adherence to the ten virtues of the Vinaya and the royal laws of the kings, protectors of men? Or the orally taught systems of the wise ancestors? This translation is nowhere near perfect, but I hope it gets closer to what the author is trying to say. It doesn’t look like this is about the ban on Buddhism in the eighth century. It looks more like a complaint about the decline of Buddhism after the reigns of the great Buddhist emperors, when the empire was beginning to fall apart. The author here is concerned about people calling themselves buddhas and teaching something that is unrecognisable as the dharma. So the decline is not a decline in numbers, but in standards. So that everyone born as a human wanted to accomplish it. Perhaps when our poem says, “Because the king died and his son was young” it is also referring to Darma and his son Ösung, who was very young when his father died in 842. The later tradition blames the decline of Buddhism very much on Lang Darma, but a close study of the sources suggests that it was only after his death that things started to go wrong for the empire, and for Buddhism as a state religion. As for those “self-appointed buddhas” that our poem decries, there are ample references to such characters in writings from the next couple of centuries (the 11th and 12th). We have, for example, reports of a Newari called Karudzin who “put a meditation hat on his head, stuck some feathers in it, dressed in fur, made the announcement at Samye, ‘I am Padma,’ and taught innumerable wong teachings.” Then there was the fellow who called himself “Buddha Star-King”, who became famous in Western Tibet until he was bested in a magical contest by the translator Rinchen Zangpo. On them, see Dan Martin’s excellent articles, listed below. That mysterious title, referring to dharma books falling from the sky, might be interpreted differently as well. Perhaps it isn’t, as Richardson and Stein thought, the first ever reference to the legend of how Buddhism first arrived in Tibet. Perhaps it is instead a sarcastic allusion to the teachings of the self-appointed buddhas, which seem to have dropped out of nowhere. I wonder if the metaphor in the broken-off last sentence might have explained the title. So, does dating the poem in IOL Tib J 370 to the tenth century rather than the early ninth make it less interesting? We lose a contemporary account of the Tibetan imperial period, but we gain a vivid portrayal of the challenges facing Buddhism in Tibet’s dark age. It’s a portrayal informed by a nostalgia for the past era of the Buddhist emperors, and overlapping with this, fears of what will happen to Buddhism in Tibet without imperial regulation. But like the similar poem in Pelliot tibétain 840, the elegant and literary way in which these fears are expressed shows (perhaps unintentionally) that at least some Tibetans remained highly literate and well versed in Buddhism. Dharma from the Sky II: Indian or Chinese dharma? 1. Hugh Richardson. 1998 (originally published 1977). “The Dharma that Came Down from Heaven”: A Tun-huang Fragment. In High Peaks, Pure Earth. Chicago: Serindia. 74-81. 2. R.A. Stein. 1985 “Tibetica Antiqua IV: La tradition relative au début fr bouddhisme au Tibet.” BÉFEO 74: 83-133. Both Richardson’s and (especially) Stein’s are well worth reading and contain many more insights about this text that I haven’t covered here. 3. Dan Martin. 1996. “Lay Religious Movements in 11th- and 12th-Century Tibet: A Survey of Sources.” Kailash 18.3-4: 23-55. 4. Dan Martin. 1996. “The Star King and the Four Children of Pehar: Popular Religious Movements of 11th- to 12th-Century Tibet. Acta Orientalia 49.1-2: 171-195. 1. The thing that I still can’t make out is that triad of zhu / chos / rdo rje theg. Richardson suggested reading the first word as gzhung, but the scribe actually wrote a /g/ and then crossed it out, and his or her spelling is not that bad. And why should the vajrayāna be separate from the dharma? 2. I’m aware that “self-appointed buddhas” as a translation of sangs rgyas rang bzhugs is not uncontroversial. I have taken bzhugs with its connotation of assuming a position, as in the term for enthronement, khri la bzhugs. But rang bzhugs could be translated in other ways. In the late 960s a pilgrim passed through Amdo. He was a Chinese monk from Wutaishan, and like many Chinese Buddhists before him, he hoped to visit India to study at the great university of Nalanda. 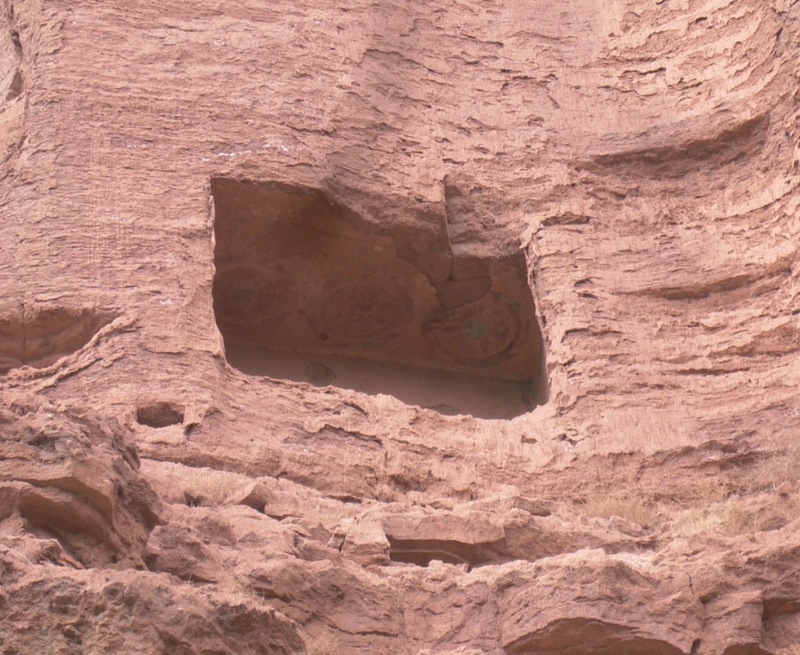 We know about this particular pilgrim because he left his passport behind in Dunhuang, where it was sealed into the library cave and only emerged again in the 20th century. The city of Hezhou, now known as Linxia. The mountain retreat of Dantig (see the previous post). The city of Tsongka, near the modern city of Ping’an. The city of Liangzhou, now known as Wuwei. And then along the Silk Route to Ganzhou and Dunhuang. All of these places (except Dantig) are now Chinese cities, with very small, if any, Tibetan population. There is little left to show that many of them were once strongholds of Tibetan culture and Tibetan Buddhism. The pilgrim’s itinerary tells us that he was visiting Hezhou and Tsongka to see their “gold and turquoise temples.” And these were not little kingdoms either. Chinese sources report that in the year 998 Liangzhou had a population of 126,000, the majority of whom were from Tibetan backgrounds. If you squint, can you see Tsongka’s shimmering gold and turquoise temples through the heat haze and pollution of Ping’an? Perhaps not. 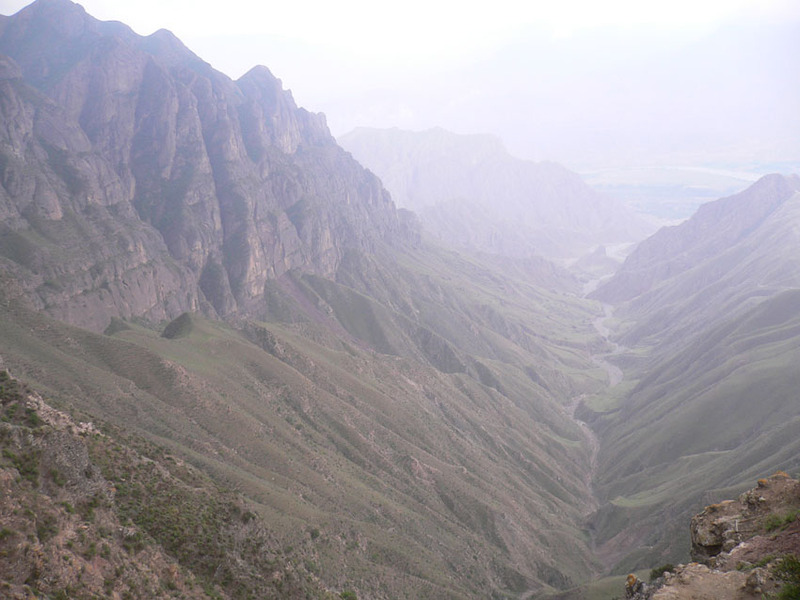 But you can go just a little way out of the city, where the mountains rise up on the other side of the Yellow River, and visit the ancient cliff temple of Martsang. Here, it’s said, was where the monks who fled the persecution of Buddhism by the emperor Lang Darma (see here), finally came to rest. 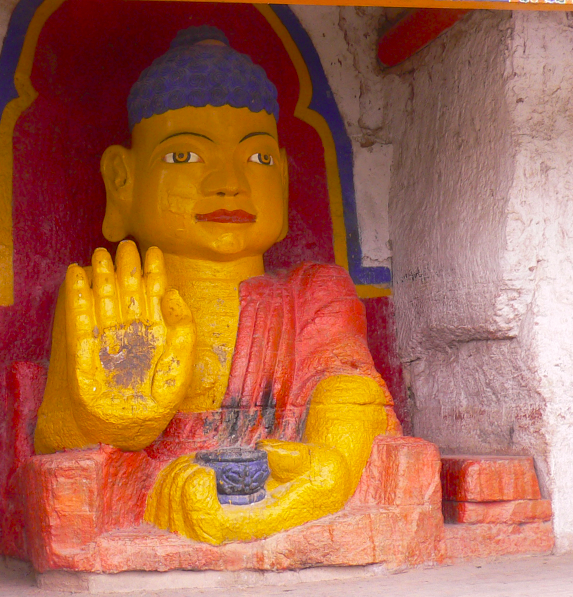 Below the temple at Martsang is this image, said to be a self-manifesting Maitreya. That is to say, the image is said to have emerged spontaneously from the rock. I heard that it was dated by scientists to the Tang dynasty, but I haven’t been able to verify that claim. In any case, as you can see, it seems to have been repainted fairly regularly. 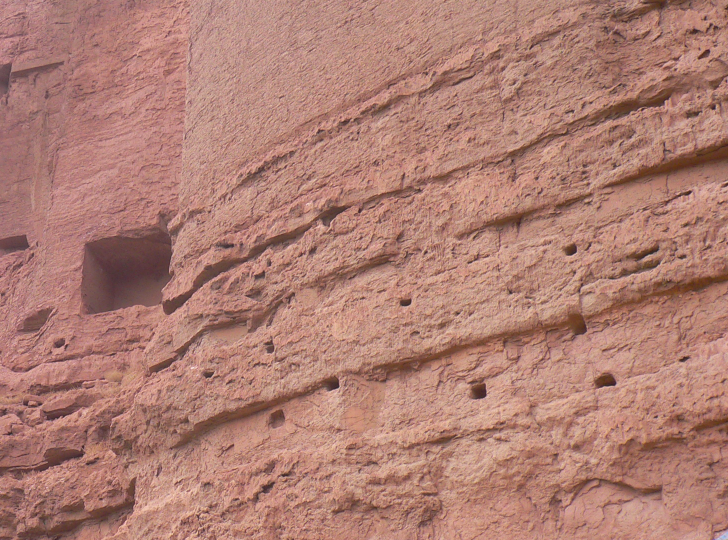 In the cliffs above the Maitreya image you can see this inaccessible cave. If the temple at Martsang isn’t old, this certainly is. Notice the three mandalas painted on the ceiling. And notice as well the little square holes leading up to the cave. Perhaps this was once a walkway, or an even bigger structure built into the side of the cliffs. It seems that there was once a larger complex of Buddhist caves here. From here, when you turn around and look back towards the modern city sprawling below you, and beyond that the lush Yellow River valley it’s easier to believe that this was once home to a Tibetan kingdom. Ronald Davidson. 2005. Tibetan Renaissance. New York: Columbia University Press. Ruth Dunnell. 1994. ‘The Hsi Hsia’. In Herbert Francke and Dennis Twitchett (eds. ), The Cambridge History of China, vol.6. Cambridge, Cambridge University Press. 907–1368. Iwasaki Tsutomu. 1993. ‘The Tibetan Tribes of Ho-hsi and Buddhism during the Northern Sung Period’. Acta Asiatica 64: 17–37. At some point Tsongka seems to have changed its name slightly, with the final ka turning into a kha. I have no idea why this happened, but I suppose it was some time between the tenth and fourteenth centuries. Surrounded by steep mountains, the valley of Dantig is still only accessible on foot. Starting from the town of Xunhua, you climb up a steep valley and then walk along a vertiginous mountain ridge. The walk took us about five hours, though the locals claim to be able to do it in two. 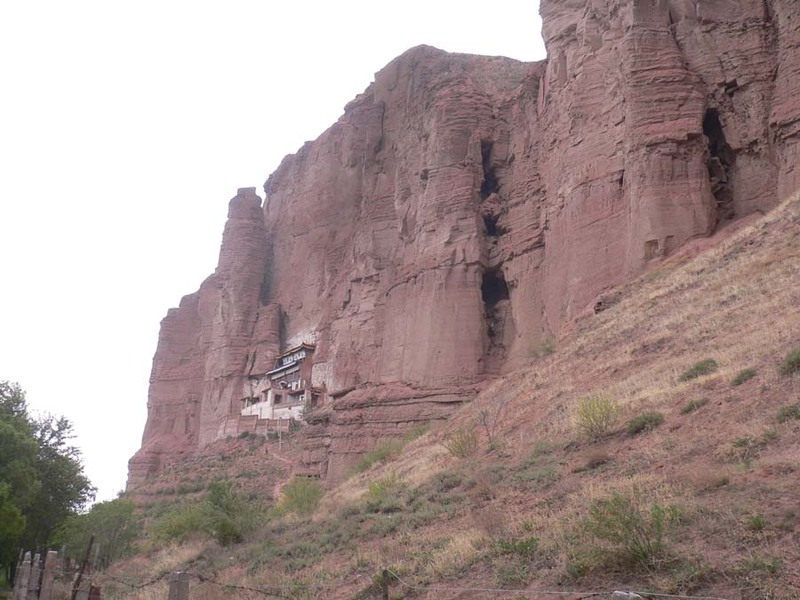 The valley has an impressive sequence of cave temples, and a relatively small monastery. 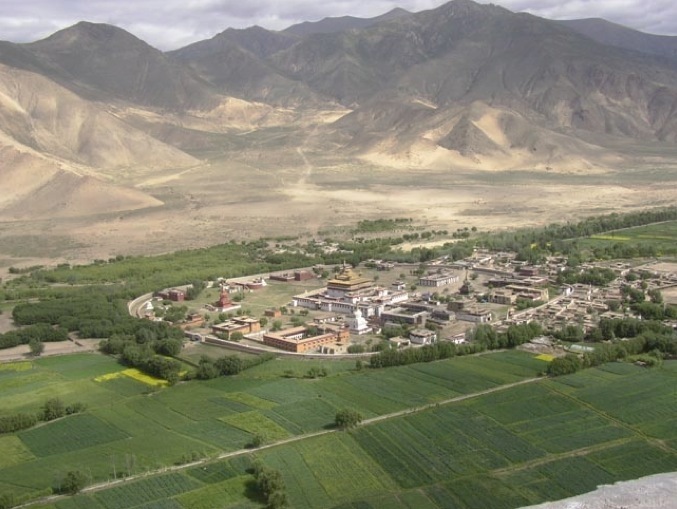 At the moment, there is also a permanent population of around seventy Tibetan monks, most of whom live in mud-brick houses on the valley floor, and study at the valley’s monastic college (slob grwa). There are many fascinating things about this site, but the one I want to talk about here is the name itself. I’d always assumed it was a local Chinese name that was transliterated into Tibetan when the valley became a major Tibetan Buddhist site. But it seems the truth may be more complicated, and more interesting. I travelled to Dantig, with my colleague Imre, to follow the path of a tenth-century Chinese pilgrim. This pilgrim’s itinerary is given in a scroll he carried with him, and left behind in Dunhuang. This itinerary (written in Tibetan) mentions Dantig, and this is in fact the earliest occurence of the name in a documentary source. So, where does the name Dantig (dan tig) come from? There is a copy of this sūtra in a Tibetan manuscript from Dunhuang – IOL Tib J 76 — which confirms that the story, and the occurrence of the name of Dantig in it, was known in the tenth century. Now, if we look at the version of the same sutra found in the Tibetan canon, it has a colophon stating that it was translated from the Chinese. And in the original Chinese version of the sutra the name of the mountain is Tante Shan 檀特山. According to the Foguang Dictionary of Buddhism, this in turn represents an Indian place-name, Mount Daṇḍaka, thought to be located in Gandhara. The close association between the valley and the sutra is also made very clear when you visit Dantig. One of the cave temples here is dedicated to a certain Gelong Achuda. Though we had a hard time identifying him at first, it turns out that this fellow is in fact another figure from the Jinaputra-arthasiddhi-sūtra, who was said to have meditated in Dantig for a hundred years. We’ve made some progress towards understanding how Dantig got its name, but the big question remains. Why did the mountain that features in the Jinaputra-arthasiddhi-sūtra became associated with the valley of Dantig in Amdo in the first place? Are there comparable cases in Tibet or China of Jātaka stories being linked to local sites? I’ll leave these questions open for now. Tibetan version: ‘Phags pa rgyal bu don grub kyi mdo (no.1020 in the Peking bka’ ‘gyur). Chinese version: Taizi Xudanuo jing 太子須大拏經 (vol 3, no. 171 in the Taisho Tripitaka). 1. Brag dgon pa dkon mchog bstan po rab rgyas. Mdo smad chos ‘byung, or, Yul mdo smad kyi ljongs su thub bstan rin po che ji ltar dar ba’i tshul gsal bar brjod pa deb ther rgya mtsho. Rig gnas myur skyon dpe mdzod khang. n.p. n.d. (see pp.222-3). 2. Durt, Hubert. 1999. ‘The offering of the children of prince Viśvantara / Sudāna in the Chinese Tradition’. Journal of the International College for Postgraduate Buddhist Studies 2: 266–309. 1. The approach to the Dantig valley, looking back over the neighbouring valley, (c) Imre Galambos. 2. The cave temple of Gelong Achuda (c) Imre Galambos. The first time I read Shakabpa’s Political History of Tibet, I was fascinated by a reference he made to the Kamalog, a group of Tibetan soldiers posted to the far northeastern borders of the Tibetan empire (now known as Amdo). Apparently, when the empire fell apart, these soldiers waited for orders to return but never received them. So they settled down, married, had children, and became Amdo people. Yet they and their descendants always remembered their Central Tibetan heritage. During the reigns of the dharma king Tri Song Detsen and his fourth son Desongtsen, armies were raised on all the borders of Tibet in order to stop the opposing armies. With many hundreds of thousands of Tibetan soldiers, the meditation centres* of Central Asia were conquered. After that, nine heroes selected from the army for their ability were stationed at the border between Central Asia and Tibet. When they asked, “May we return?” the message from the king was, “Our edict once issued is irreversible.” Thus the descendents of these nine heroes were called Kamalog (“not to return by order”). Much later, there arose many families of Tibetan nomads who were Kamalogs. Even Sechen’s great minister Sangha Ching seems to have been from a Kamalog clan. Those who became separated from the family line are said to remain in eastern Tsongkha, in the Kokonor basin. The story, with its symbolically important number of nine heroes, has the flavour of a legend. But the general principle, that some soldiers remained in Amdo after the empire fell apart, is almost certainly true. Still, I wondered, as I passed through Kamalog County, halfway between the modern cities of Xining and Lanzhou, why has the story remained so powerful here in Amdo? Although my family had settled in Dokham, my forefathers came from Central Tibet. How they came to settle in Eastern Tibet is a simple story. Hundreds of years ago, in the reign of King Mangsong Mangtsen, a Tibetan army was stationed in the northeastern part of Tibet to protect the frontiers. In our part of Dokham,† a garrison from Phempo in Central Tibet was stationed, and family tradition said that my forefathers came with that garrison. In our family dialect we still used many words from the Phempo district, rather than the east: words like cheney for bowl and khenbu for spoon. This is not just a repetition of the story in the Religious History of Amdo. The Dalai Lama’s family tradition specifies which region of Central Tibet their ancestors came from. It also places the event further back in the past, in the reign of Mangson Mangtsen (c.643-676) rather than Tri Song Detsen (756-c.800). I couldn’t possibly confirm or deny the existence and significance of words from Central Tibetan dialects being used in Amdo. What’s clear is that there have been many traditions handed down in Amdo families that tell of an ancestral connection to the armies of the Tibetan empire. On the maps of “ethnographic Tibet” — i.e. those that attempt to demarcate the extent of Tibetan culture rather than the political rule of Central Tibet — the Dalai Lama’s birthplace is at the very edge. In fact, the Dalai Lama’s first language, and that of his village, was the local Chinese dialect (see Laird 2007). Thus it seems that one of the things that the story of the Kamalog achieves is to bind these people of the borderlands to the centre. It brings the furthest reaches of Amdo into the great narrative of the Tibetan Empire, placing the heroes of the empire among the people of Amdo, and mingling the bloodlines of the Tibetans at the centre with the Amdowas at the border. * Strange this. I wonder if sgom grwa is a textual corruption? † Note that Dokham (mdo khams) is another name for Amdo, or for both Amdo and Khams. 1. Shakabpa. 1967. A Political History of Tibet. New Haven: Yale University Press. (On the Kamalog, see p.43). The meditation cave of Martsang (dmar gtsang), near the modern town of Ping’an, in Tsongkha Khar, near Kamalog, (c) Imre Galambos. …to an excellent new website on the Amdo dialect. …there was a brilliant young scholar called Ngagi Wangpo. He was one of the star students at the great monastic college of Sangpu. Ngagi Wangpo had decided to become a monk at the age of twelve, having lost his mother at eight and then his father at eleven. Studying at Sangpu, he quickly mastered a curriculum which included logic and the philosophical complexities of the Madhyamaka. But his time at college was marred by the small-mindedness of his fellow students. Sangpu was dominated by students from eastern Tibet: Khampas. True, Sangpu was in Central Tibet, but Kham has always provided a high proportion of Tibet’s greatest scholars, and this was reflected in the student body at Sangpu. As a Central Tibetan, Ngagi Wangpo felt that he was treated as an outsider. So at the age of twenty-seven (in the year 1334) he decided to drop out. As he walked away from the college where he’d spent the last eight years, Ngagi Wangpo met an inquisitive monk who asked him why he was leaving. Come where they may, they tear the place down. Everywhere the clamorous Khampas gather there’s trouble. After turning his back on a lifetime of study, Ngagi Wangpo adopted the wandering life, dedicating himself to meditation practice and looking for a guru. His search came to an end when he met a yogin called Kumaradza, who was living on a mountainside with a large group of disciples in flimsy tents. Ngagi Wangpo was accepted as a disciple and joined this motley crew of dedicated meditators, who pitched camp and moved to a new home every few months. Over the years that followed he learned the Great Perfection (Dzogchen) at the feet of Kumaradza. In the end he surpassed his own master, and wrote the definitive works on the Great Perfection. Ngagi Wangpo became one of the most famous Tibetans of all time, better known by his academic title Longchen Rabjampa, or for short, Longchenpa. Now, you might think it unlikely that a rather complicated poem like this, not only constrained by an alphabetic conceit but written in nine-syllable verses containing a wealth of literary allusions, could be dashed off in the way the story implies. But let’s not forget who we’re talking about here: one of the greatest poet-philosopher-mystics in history (and not just the history of Tibet). One thing his voluminous writings show is that writing inspired poetry was second nature to Longchenpa. I for one don’t doubt that, spurred on by the frustrations that had just led him to drop out of Sangpu, Longchenpa could have sat down and written these verses in very little time at all. And so are the multitude of living beings in existence. The nonduality of true and untrue, that’s the state of a buddha. Bla ma dam pa kum ma rā dza la rtogs pa phul ba zhes bya ba bzhugs, in Gsung thor bu, vol.II, pp.352–357. (Quotation from p.353). Leonard van der Kuijp. 1987. “The Monastery of Gsang-phu Ne’u-thog and Its Abbatial Succession from ca. 1073 to 1250.” Berliner Indologische Studien 3: 103-127. Why does history get written? I think we’d all agree that the motives for creating history are mixed, and just as complex as the uses it gets put to after it’s written. Though most of Tibet’s histories are histories of religion, it would surely be naive to imagine that the motives of their authors were wholly religious. After all, the union of religion and politics (chösi zungdrel in Tibetan) was not just a fact of life in Tibet, it was an ideal, a dearly-held expression of the uniqueness of Tibet’s culture. So how does this apply to the story of the great debate between Chinese and Indian Buddhism that is supposed to have taken place at Samyé monastery under the aegis of the emperor Tri Song Detsen? The debate is certainly presented in religious terms, as a battle between two interpretations of the Buddhist scriptures. On the Chinese side, the Chan approach of the single method: the realization of the nature of mind leading to instant enlightenment. On the Indian side, the gradual approach of the six perfections leading to a gradual awakening in ten stages. The classic account of the debate and the source for all later Tibetan historians, is the Testament of Ba. And this, even in the earliest form available to us, is clearly not a disinterested account. It gives the proponent of the Chinese view a brief paragraph to defend his position, followed by pages and pages of the proponents of the Indian view. And most of the refutation of the Chinese approach is spoken by a Tibetan nobleman from the Ba clan. But hang on, isn’t the Testament of Ba all about the Ba clan? Well, it certainly seems to have been put together by people from that clan, and it certainly places the Ba clan in the middle of the action in the story of how Buddhism came to Tibet. As for the Ba clan, they were deeply involved in the imperial court and often in competition with the Bro clan for the top ministerial positions. They seem to have played some part in the conspiracy against the Buddhist emperor Ralpachen, leading to his assassination and the enthronement of the deeply unpopular Langdarma. Given that Langdarma came to be blamed for the collapse of monastic Buddhism in Tibet, and the inception of the age of fragmentation, it seems that the Ba clan had some PR work to do if they wanted to demonstrate their credentials as supporters of the revered Buddhist emperors. And that’s what the Testament of Ba does, quite successfully. So where does the story of the debate fit into this? Obviously it puts the representatives of the Ba clan at the side of the greatest Buddhist emperor. It may also be a not-so-subtle attack on another major clan, the Dro, the clan that most frequently crops up in the Ba clan’s power struggles. And as the empire began to fall apart the first civil war was between the governor of Tibet’s northeastern territories (who was from the Dro clan) and a general who wanted to set himself up as a local warlord (from the Ba clan). The governor sided with the new Chinese power in the region, and the general was, after committing some appalling brutalities, eventually executed. For more about this see here and here. The Chan doctrine taught by Mahayana is a fully-justified development based on the text of the sutras; it is without error. From now on the monks and laity are permitted to practise and train in it under this edict. But what is most relevant to us is that it mentions that Moheyan was invited by one of Tri Song Detsen’s queens, the one from the Dro clan. The Chinese author of the text makes this quite clear. The master Artenhwer, an instructor who knew the path of the sameness of all phenomena travelled to Anxi from India, for the sake of sentient beings. There he gathered three hundred students, and taught them how to enter the Mahāyāna. 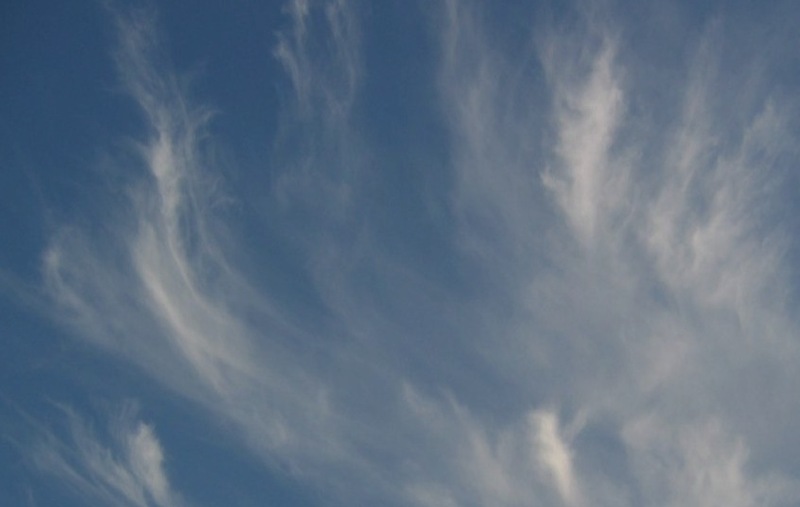 He received divine food offerings from the sky, which satiated his three hundred students. At over a hundred years old he passed away in the posture of nirvana. Then the king of Anxi struck the body and said “If the master came to explain the dharma to multitudes of sentient beings, why did he only teach a few words?” And, having died, the master rose again for three days and taught the dharma to the king of Anxi and the Chinese prince of Gazhou. The lineage of this Artenhwer gets passed down to a Chinese monk called Man Heshang. And he is supported by Trisumjé, the delön (the minister responsible for the northeastern marches of the Tibetan empire) — this is almost certainly a famous Tibetan minister from the Dro clan who lead the negotations for to the 823 Sino-Tibetan peace treaty. Later in this Chan lineage there’s a Tibetan master called Puk Yeshé Yang, who is supported by a monk from, once again, the Dro clan. So, is it reasonable to suggest that the Chan teachers like Moheyan were known to have the patronage of the Dro clan? That would certainly make the story of the debate in the Testament of Ba very useful in their struggle with the Dro. Not only does it place them at the centre of the narrative of the transmission of Buddhism to Tibet, it’s also one in the eye for the Dro clan and their favourite Chan teacher. This rivalry might answer a question posed by Matthew Kapstein: why is Testament of Ba generally well disposed towards Chinese Buddhism, except in the story of the debate? Earlier in the Testament of Ba we hear about a member of the Ba clan travelling to China receiving teachings from the Korean Chan teacher known as the Reverend Kim. While later Tibetan historians tended to present the debate as a rejection of Chinese Buddhism per se, the Testament of Ba, especially in its earliest known forms, suggests more specifically a rejection of Moheyan’s brand of meditation practice. That’s enough for now. I won’t go into the question of whether the debate actually happened, although the very different version in the Chinese text certainly suggests that we might be better off thinking of a series of discussions, mostly by exchanges of letters, rather than a debate. And the author of 10th century Lamp for the Eyes of Meditation, which is all about how to rank the simultaneous and gradual methods, fails to mention any debate. And many, if not all, of the Tibetan Chan manuscripts from Dunhuang date from after the Tibetan empire, and thus well after when the debate was supposed to have happened, suggesting that the decline of Chan in Tibet happened slowly, and for other reasons. So where is Anxi (An se in the Tibetan text)? Most people, following Lalou, have identified it with the great northern Silk Route city of Kucha. But this might not be right. Anxi was the name of the Chinese command centre for its western territories. This was in Kucha until the late 680s, when that city was taken by the Tibetan army, and the Chinese moved the Anxi commandery to Qocho (Ch. Gaochang). By my calculations, separating each member of the lineage by 25 years, Artenhwer should have been around in the first half of the 8th century, by which time Anxi may have referred to Qocho. And Dro Trisumjé? Hugh Richardson considers the identification of Pelliot tibétain 996’s Trisumjé with the army commander Dro Trisumjé doubtful. But it doesn’t seem at all unlikely to me that bde blon Trisumjé mentioned in Pelliot tibétain 996 might have later held the role of army commander (dmag gi mchog). His involvement in the Sino-Tibetan treaty involves the same region that fell under the rule of the bde blon. A letter written by a Chinese officer to a Zhang Khri sum rje (Pelliot tibétain 1070 — see Demiéville’s Concile de Lhasa, pp.280-290) says that he chose Dunhuang as his residence and founded a temple there. Roberto Vitali has argued that this is Dro Trisumjé, and that he must have lived in Dunhuang before 810, when, due to a promotion to the rank of minister and general of the northeast army, he would have moved to a major prefecture like Guazhou. Though Vitali didn’t consider Pelliot tibétain 996, the fact that Trisumjé held the post of bde blon only strengthens his case. 2. Pasang Wangdu and Hildegard Diemberger. 2000. The Royal Narrative Concerning the Bringing of Buddha’s Doctrine to Tibet. Wien: Verlag der Osterreichischen Akademie der Wissenschaften. 3. Sam van Schaik and Kazushi Iwao. “Fragments of the Testament of Ba from Dunhuang”. Journal of the American Oriental Society 128.3 (2008 ): 477–487. 4. Paul Demiéville. 1958 (republished in 2006). Le Concile de Lhasa. Paris: Institute des hautes études chinoises. 5. Marcelle Lalou. 1939. “Document tibétain sur l’expansion du Dhyāna chinois.” In Journal Asiatique October-December 1939: 505-523. 6. Zuiho Yamaguchi. 1996. “The Fiction of King Dar-ma’s Persecution of Buddhism”. In De Dunhuang au Japon. Geneva: Librairie Droz. 231-258. 7. Luciano Petech. 1994. “The Disintegration of the Tibetan Kingdom”. In Tibetan Studies, edited by Per Kværne. Oslo: The Institute for Comparative Research in Human Culture. 9. Roberto Vitali. 2004. “The role of clan power in the establishment of religion (from the kheng log of the 9-10 century to the instances of the dByil of La stod and gNyos of Kha rag).” In The Relationship between Religion and State : (chos srid zung ‘brel), in Traditional Tibet, edited by Christoph Cuppers. Nepal, Lumbini International Research Institute. 10. Matthew Kapstein. 2000. The Tibetan Assimilation of Buddhism. Oxford University Press, 2000.